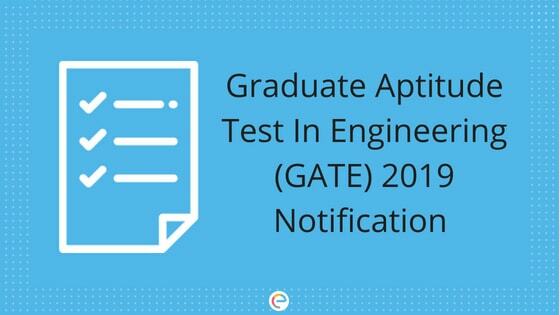 GATE Notification 2019: The Graduate Aptitude Test in Engineering (GATE) is an exam conducted every year to evaluate the knowledge and understanding of candidates in various undergraduate subjects of Engineering/Architecture/Technology as well as various Science subjects of post-graduate level. The exam is conducted for admission to Master’s and Doctoral programs in Engineering / Architecture / Technology as well as Doctoral programs in various branches of Science. Even many Public Sector Undertakings (PSU) in India recruit through GATE. The exam is conducted jointly by the Indian Institute of Science (IISc), Bangalore and one of the Indian Institutes of Technology (IIT). This year, IIT Madras is going to conduct the examination. The online registration for GATE 2019 was scheduled from 1st September to 3rd October 2018. Candidates must have a clear knowledge of all the aspects of the exam, like eligibility criteria, important dates, how to apply, etc. In his article, we will provide you with all the necessary information regarding GATE Notification 2019. Read on to find out. Age Limit: Ther is no age limit to attempt GATE exam. Nationality: Candidate must be an Indian national. Besides that, candidates from Ethiopia, Sri Lanka, Bangladesh, UAE and Singapore are also eligible for GATE. Pass Percentage: There is no minimum pass percentage criteria in the qualifying exam to apply for GATE. Educational Qualification: All the candidates must have passed their respective qualifying exams or can be in the final year of the course except for few courses. B.E. / B.Tech. / B.Pharm. 1. Candidates must hold Bachelor’s degree in Engineering or Technology (4 years after 10+2 or 3 years after B.Sc./Diploma in Engineering or Technology) or be in the final year of the course. 2. The candidates’ year of qualification shouldn’t be later than 2019. B.Sc. (Research)/ B.S. 1. Candidates must hold Bachelor’s degree in Science (Post-Diploma/4 years after 10+2) or be in the final year of the course. B. Arch. 1. Candidates must hold Bachelor’s degree of Architecture (5 years course) or be in the final year of the course. M. Sc./ M.A./MCA or equivalent 1. Candidates must hold Master’s degree in any branch of Science/Mathematics/Statistics/ Computer Applications or equivalent or be in the final year of the course. Diploma or 10+2) 1. Candidates must have completed Integrated Master’s degree program or Dual Degree program in Engineering/Technology (5 years program) or be in the 4th/5th year of the course. 2. The candidates’ year of qualification shouldn’t be later than 2020. Int. M.E./M.Tech. (Post-B.Sc.) 1. Candidates must have completed Post-BSc Integrated Master’s degree programs in Engineering/Technology (4 years program) or be in the 2nd/3rd/4th year of the course. 2. The candidates’ year of qualification shouldn’t be later than 2021. Pharm. D. (after 10+2) 1. Candidates must have completed Six years program, consisting of internship or residency training during the sixth year; or should Currently be in the 4th/5th/6th year. Int. M.Sc./ Int. B.S.-M.S. 1. Candidates must have completed Integrated M.Sc. or 5 years integrated B.S.-M.S. program or be in the final year of the course. Step 1: Go to the official website – appsgate.iitm.ac.in. Step 2: Click on the link provided to apply for GATE 2019. Step 3: Register yourself by providing your full name, valid email ID, mobile number, and password. After successful registration, candidates will be provided with an Enrollment ID. Log in using your enrollment ID and password. Step 4: Enter your Personal Details. Step 5: Provide your postal address along with PIN code. Step 6: Enter your Academic Details. Step 7: Enter the name and address of your college along with PIN code. Step 8: Enter the GATE subject (paper) you want to appear for and choice of exam cities. Step 9: Upload scanned images of your Photograph, Signature, Eligibility Certificate and other documents in the necessary format and size. Step 10: Make payment of GATE application fees. Step 12: Take a print out of your GATE online application form for future reference. GATE application fees can be paid only in the ONLINE mode, through Credit/Debit Cards and Net Banking. Candidates must have a clear idea about the GATE exam pattern. GATE exam for all papers consists of 65 questions. The time duration for the exam is 3 hours and the maximum marks is 100. Out of the 65 questions, 10 questions carrying 15 marks will be on General Aptitude (GA). The remaining 55 questions will be on Engineering Mathematics and the subject you have applied for. There is negative marking in GATE 2019. 1/3rd of the mark allotted to a question will be deducted for wrong answer. However, there is no negative marks for NAT questions. GATE Admit Card will be issued for candidates whose application form has been accepted. The GATE Admit Card / Hall Ticket will contain all the necessary information about the exam, like name of the candidate, GATE paper applied for, exam center / venue, exam time, photograph and signature, other instructions, etc. Candidates will have to login to their account on the GOAPS by entering their Enrollment ID and Password to download their GATE Admit Card. The GATE score will be calculated based on the actual marks secured by the candidate and normalizing it (for multi session) papers. The Gate score is valid for a period of three years. The GATE result will be declared on the GOAPS website after the papers are evaluated and the scores calculated. To view the GATE result and download the GATE scorecard, candidates will have to enter their Enrollment ID and Password and login to their account. Now that you know everything about GATE Notification 2019, check out the GATE syllabus of the paper you are appearing for as well as the GATE exam pattern. Then start your GATE preparation. Give your best shot and ace the exam. We hope this detailed article on GATE Notification helps you. If you have any query, feel free to drop a comment below. We will definitely help you out.